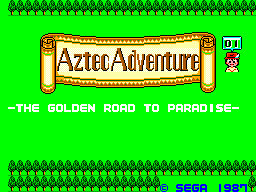 Aztec Adventure (-The Golden Road to Paradise-) / Nazca '88 (ナスカ’８８ -The Golden Road to Paradise-) - Cheats - SMS Power! Press before the Aztec Adventure scroll opens on the title screen. Press while Nino tosses money at the other characters. Press while all characters are walking toward the left side of the screen. Nino's face will appear next to the Aztec Adventure scroll to confirm correct code entry. Use the D-pad to change the level numbers appearing below the face. Start the game, and at the screen with the rainbow, press x1, x20. 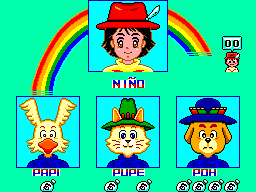 Nino's face will appear to the right of the rainbow to confirm correct code entry. Use the D-pad to change the numbers appearing above the face to select a sound, then press . To resume game play, select sound 00 and press .